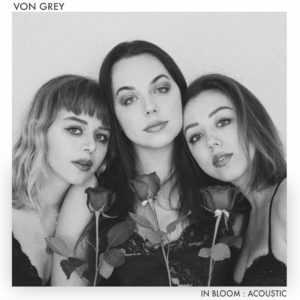 The sisters VON GREY (Annika, Kathryn, and Fiona) have released In Bloom: Acoustic – a body of work that may very well become a defining measure in their career. The EP is six of VON GREY’s folk-pop songs, not simply re-recorded acoustically, but reimagined to capture and release the painful beauty in living, loving, growing, hurting and healing. Earlier this month they released the breathtakingly emotive stunner and EP closer “Dawn” which shows the classically trained siblings far more mature and artistically developed than most of their 20-something contemporaries. By three-part harmony, pared down arrangement, and open-hearted lyric, In Bloom (which they recorded and engineered themselves), becomes a conversation of many shades and emotional colors. It’s simply a gorgeous musical flower that they have planted as their voices soar and absolutely haunt on “6 AM” and “Poison in The Water” bringing their acoustic roots to the forefront. But don’t simply take my words for it: listen to theirs. You can stream In Bloom: Acoustic below.